Despite what you read in the journals and magazines, not all marital disputes initiate in the bedroom. Despite what you read in the journals and magazines, not all marital disputes initiate in the bedroom. 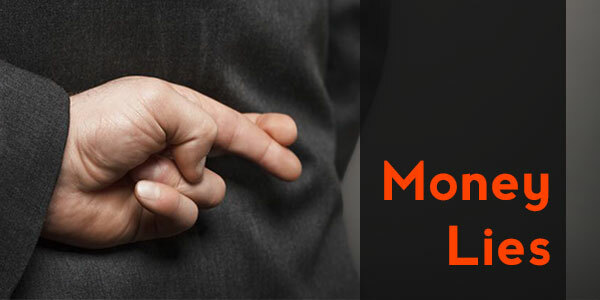 Infidelity in any form is not good and financial infidelity is the main reason behind many divorces. Marriage is based on love and trust. The moment you break the trust of your spouse, problems begins. Almost 50 percent of the divorcees feel that they should have discussed money issues with their spouses before walking down the aisle. Here's a list of at least 5 money lies that can prove to be disastrous for your married life. Try to not utter these lies to your spouse if you really hate to walk on the path to divorce. This lie can prove to be fatal for your marriage. If you're delinquent on your mortgage and the lender has sent foreclosure notice, then disclose this information to your spouse. Just imagine the shock your spouse will get after the house is foreclosed and sold at an auction. Your spouse will be devastated to lose the house, but he/she will be hurt and angry to know that you've lied for so many months. You may end up spending your days in jail for uttering this lie. If you have a kid from a past relationship, then reveal this information to your spouse. Your spouse deserves to get this piece of information from you. If you've not been paying child support, then not only you but also your new spouse may get sued. Recently, there was a case where the new spouse was sued as she had a joint account with her husband. The husband didn't pay child support for several months. The new spouse didn't have any clue about it. She got to know about this after the ex-wife of the husband registered a lawsuit at the court. Don't feel ashamed to reveal your financial mistakes and frailties to your spouse. The truth will come out one day and that day can be the last day of your marital life. You may feel that you'll be able to manage your escalating debt but that may not happen in reality. Problems will start when payments are being made from your joint income. Discuss your credit reports and financial obligations with your spouse. It would be best to come clean about your finances with your spouse before making the wedding vows. If you have debts, then don't pretend that you've zero financial liabilities. Remember, if you do lie about your debts, then your marriage will be at stake. The current job market is not excellent. If you've lost your job, don't expect to get another one quickly. It may take some months to get another decent job. Don't act as if you're going to the office every day. Chances are high that your wife will come to know about it after all the savings are used to meet the monthly expenses. What will you say then? She will be shocked and hurt to know the bitter truth, albeit so late. If you have received an inheritance, then disclose this fact to your spouse. Even if you try your level best to hide the fact, your spouse may come to know about it just by having a look at your tax returns. Unless, you've decided to lie about your inheritance to the IRS, there's no point in hiding the truth from your spouse. If you really want to spend several years with your spouse, then make sure you don't break the trust of your spouse. Share your love, strength, happiness, sadness, frailties, success, and mistakes with your spouse. Be clean about your finances so that both of you don't have to part ways.